Have used this harness type for almost 3 years. It is very good for my Husky and he liked it. The issues I have had with it are that the bottom straps loosen position over time making the harness easy to pull backward and out of for the dog to escape if not kept a close eye on fitting it properly. More recently, it has really been rubbing under his legs and his fur/skin is getting irritated. The top strap seems to be a bit too far forward and makes the bottom one rub under the legs no matter how it is adjusted. It didn't used to do that for the past few years, it still fits well but maybe his shape has changed and now it is time for something new unfortunately. > PetSafe Response: We're sorry to hear that you've run into issues with your Easy Walk Harness, Brian! The problems that you describe can typically be solved by readjustment of the harness. When your dog is wearing the harness and you look at it from the side, be sure that it resembles a sideways 'T' shape; if it more closely resembles a sideways 'Y', the harness will need to be readjusted. We are always happy to help out with issues like this and would love to speak with you. Please give us a call and we will be happy to help. Thanks again. We rescued a female malinois 2 months ago. She's 6 years old, and exhibits fear aggression, a strong prey drive, and pulls viciously on choke and regular collars as well as traditional harnesses. Yesterday I purchased an Easy Walk harness. Fitment was very easy and she accepted it with no resistance. Her first walk was amazing! No pulling and rather than walking at the end of her lead she was happy to walk beside me or just in front with a loose lead. On 2 subsequent walks we encountered birds and a small dog she normally reacts to with no pulling or madness. She's a completely different dog. We can't thank you enough. I really like the product as I did help with the pulling, however my dog was raw under her right armpit. I think padding of some sort would help as the material really cuts into the skin. > PetSafe Response: Hi Judy, thanks for your feedback. We have a range of harness sizes which may be the solution, or an alternative design called EasySport that incorporates the padding. We'll contact you directly and help you to adjust the fitting of the harness so that it stops the rubbing under your dog's armpit. Thanks again. Great harness it does help with the pulling on a walk, but the only problem I have with it is that the adjusting clips need the have the teeth on them to stop the straps from getting loose all the time, to the point if I don't watch it my dog could pull right out of it. > PetSafe Response: Hi Jane, it's great to hear from you, thanks for getting in touch and sharing your feedback. We'll be in touch directly to help you with adjusting the clips as they shouldn't work their way lose so easily. Kind regards. I currently started dog walking a friend's dog and noticed that the ring to hook on the leash is in the front, I find it discomforting for myself and the dog. When it's set up in the front (shown on the photo of the box) I feel like it's choking him at times, along with rubbing up against his left leg causing him to be sore in that area. I'm also having a difficult time walking him myself because it's just pulling him to the left, it's not positioned that i can slightly pull once and he gets the idea not to keep pulling. I find when the harness is positioned the other way with the ring on the back, one strap underneath back of legs, and other strap at chest area, that he and I are a lot more safe. I'm just wondering Why do you position is that way, Whats' the motive to it being on the front chest? > PetSafe Response: Hi Tanya, great question and thanks for sharing your feedback! Traditional dog walking leads attach to the dog's collar and means he can pull, twist and turn as he pleases. It can often become quite a challenge for the walker to keep the dog under control. 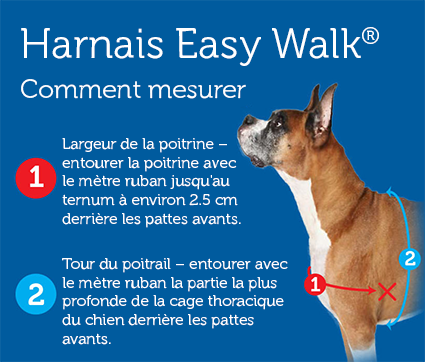 With our Easy Walk Harness, we have designed the ring hook so it's located on the dog's chest (not on their back). So when the dog pulls, the pressure is applied to the chest area which activates the dog’s opposition reflex and their natural instinct lean back against the pressure – rather than moving away from it – and reduces pulling. All dogs have a natural opposition reflex - if you push against them, they push back. If you pull them back, they pull away. So any harness that pulls from the dog’s back, actually works against the owner by increasing the dog's instinct to pull forward away from the owner. This has got to be the best invention since inventions have come along. My dog Charlie have been suffering with gagging choking bucking and pulling since we've started walking. Charlie is about a year old. Starting with the very first minute we began using the easy walk harness Charlie is like a new doggie. So much so that my wife calls it a miracle. I'm not so sure about that but Charlie is like now a pleasure to walk. He walks with me now and he's not practically dragging me along. Overall I'd say I'm very impressed with this product and would gladly recommend it to anyone. > PetSafe Response: Hello Ronald, thank you for such a glowing review of our Easy Walk Harness! We often hear that it's transformed walkies for the better, and we're pleased to hear how well it's working for you, your wife and Charlie. Thanks again! We have three dogs, our 7mth old 110lb English mastiff pulled like a train, despite our best efforts training her not to, this harness worked instantly, it has made training a breeze, we went back to a collar and she walks like she still has the harness on! We are now using it on our 6mth CaneCorso with identical results. Thanks petsafe! I have been trying different tools for my service dog prospect of a year old, and found this harness to work well. Yesterday I picked it up to put on him for more leash training, and I found the buckle had cracked open. It does still function but I do not feel safe walking a 60 pound dog with a broken buckle, so I resorted back to the prong. I'm hoping to have this sorted out, maybe I had a weak buckle. > PetSafe Response: Hi Shawn, sorry to hear that you've had a problem with the buckle on your harness. Please get in touch with our Customer Care team and they'll be happy to help you. Thanks for taking the time to feedback. I've had two of the hardest pulling and strongest/largest dog breeds out there, an American Bulldog of 100lbs and a Great Dane of 120lbs. It was always a challenge to keep them from yanking my arm off or not have them choke themselves out while walking on the lead and to keep them safe from dashing towards another animal or into traffic. These harnesses are a must for any dog owner and now all I need is slight, two-finger pressure to stop or slow the dog down. No more constant pulling and we have full control at all times. Thanks for making a great product that has changed our lives and made us and our dogs happier. I have a real "puller" a goldie/cocker mix. I tried everything, back latch harnesses, choke chains, finally a pinch collar (which I hated to use). This was recommended to me at the pet store, and it's like night and day! Easy on, slack lead, no more pulling! Incredible. No more pulling. Its a 10 star, never mind 5. I look after dogs so I am definitely going to recommend it to my dog owners. Thank you, Mr. or Ms. Inventor. I first purchased an Easy Walk Harness five years ago for my Bernese Mountain Dog. She was very head strong and despite my size she could pull me along as if I was paper. From the first time I placed the Easy Walk Harness on her, it became a real joy to take her for a walk. She calmed right down and stayed by my side and was very happy. I was so impressed that when I bought my second dog, two years later,I bought a second Easy Walk Harness. I now have a third dog, my Bernese having died, and used the first harness on him. He went from a wild uncontrollable animal to a well behaved pup in minutes. Unfortunately the clasps on that harness have broken and I have to purchase a new one. An excellent product by far. Going for a walk with our staff and greyhound was never a pleasure it was more them dragging me along and my back, shoulders and arms always hurt when we got back. But now, what a transformation! its a pleasure to go for a walk now, now pulling and no sore arms. Amazing. > PetSafe Response: Dee that is great feedback, we're happy to hear your pets are enjoying the Easy Walk Harness. I have 2 very beautiful but very large Alaskan Malamutes and I struggle to enjoy a walk with them both. Usually there is all sorts of calamity no matter what sort of control harness I have used. Having looked up the Easy Walk Harness and read some reviews, some from fellow malamute owners, I decided to make the purchase. WOW!! I have just come back from an hour long walk with my babies and have enjoyed every minute. The control is fabulous and they caught on very quickly that they will get no where by pulling which is something that has not happened with other harnesses on the market. I have already recommended this product to friends and family who also currently get taken for walks with their dogs when it should be the other way round!!! Fabulous product and exceeded my expectations!! !